The energy saving yet high performance NA-812A is a 1U-height desktop network appliance for small and home office (SOHO) market. Designed with green concept in mind, the NA-812A integrates a low power Celeron M 1.2 GHz processor with the Mobile Intel GM45 Express chipset. Advanced power savings allow for a low total cost of ownership. The NA-812A is high-flexible, low-power, high-port-density network appliance for VPN, content filtering, UTM, network security gateway and other embedded box with multiple-LAN solutions. For system login with monitoring and building control proxy, the NA-812A has space for a 2.5" SATA2 hard drive for software porting by software solution providers. For customer easily porting LAN bypass feature with their application program, we provide development kit with micro code for migration. 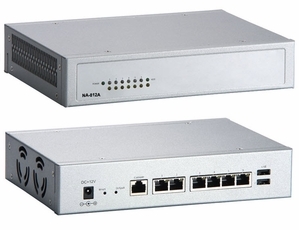 The ultra low power NA-812A also features function of BIOS redirection to console port. The built-in Intel Active Management Technology 4.0 has answered today's customers' needs of enhanced security and remote access for easier maintenance.